Todd, come on man… that was clearly intentional. ._. I am excited to announce that this comic is the second-to-last strip before the end of the first chapter. Next Monday’s update will be the final strip of Chapter 1. Squeeeeee! Girl has better aim than I could have ever dreamed of! I really, really, really wish I could do that. I freaking love this comic. Seriously. Freaking love. Note to self: never to play billiards with Selkie. With an eye for physics and geometry like that on a three-dimensional field, I shudder to think what she could do on a flat pool table. I bet it would be made of awesome. Horrifyingly awesome = this bit. I said what I needed to say. What, I didn’t say anything Shakespeare wouldn’t say…. Her face is so adorably horrifying in the last panel, she’s so cute! Parental perogative: praise, and at the same time, don’t punish. Of course it was obvious, but the power of awesome takes precedence. Kind of like an art critique of the fingernail-polish-and-eyeliner giant boat on the bedroom wall done by an enthusiastic three-year-old with no fear of heights. Girl’s got serious game, there. Hmmmm, they could make an extreme water volleyball league. Selkie would be the all time master and all of the other teams would be floating belly up, lol. I would really like it if at the bottom of every comic where Tony speaks we could have some kind of translation. Just put an asterisk next to it and include it in a footnote. I took French for a few years, but I’m not fluent enough in it (and don’t remember enough) to be able to follow everything he says. I took french for a few years (recently) and was pretty decent at it, so wihle I’m no expert, I can understand basic stuff pretty easily. The French here (in this particular instance, anyway) has some sketchy parts (formal tense in informal context, “allumer” actually means “to turn on/light up”, etc) but these are mostly minor quibbles and it’s all pretty understandable. Try google translate. It’s fairly accurate, more so than bablefish. Sorry’s, I’s clumsy, ands Todd’s oblivious. Also, let’s not forget that not only did she hit two people, only for it to land in the hands of the one in the middle, but she did it whilst moving away from them. She probably had to do an over-the-shoulder toss, or else she’d have fallen down. Yeah this is late, but about the feet… if Selkie simply had large feet, as suggested elsewhere, then it should be possible for the orphanage to obtain large shoes. 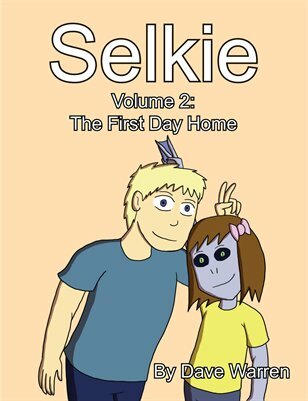 There’s simply no reason they couldn’t… unless Selkie’s bone structure was different than humans. Humans have a sort of arch from their heal to the balls of their feet, and another small arch somewhat perpendicular to that; that makes it possible for them to stand. Selkie might not actually have a heelbone, however, as heels would get in the way of flippers and–You know what, I’ll draw a picture and have it up tomorrow. Er, Dave, I’ve been meaning to ask if Tony’s lousy French was part of the joke. It sounds like the mutant spawn of an archaic phrasebook and a really bad Internet translator. Do you realize that in panel 3 Tony is addressing Moonsong as a superior? In most other panels, he isn’t using the right verb tense to be addressing anyone at all. Translation of panel one: Lighting on fire, little shrimp! Jumping more high! You can email me with anything you’d like Tony to say in French, and I can render it a whole lot better than whatever you’re using. Might as well get some use out of my Quebec origins. Thank you for the corrected translations, I’ma go ret-con this strip post haste. Hopefully I’ll remember your offer when we eventually return to Tony and the other kids. Hmm… I was thinking of entering another fanart, a better one to make up for the first one I did, of some of the Orphanage kids. Awesome how devious Selkie looks in the end of the strip! Also, THANK YOU, DAVE!!! We at Shards just got some fantastic fan art from Dave of our Miss Muffet character. Sorry I didn’t respond sooner. Been at a con:) Dave, we’ll have a fan art page up and running soon and yours will be #1! Sweet Poseidon, I just realized Tony spoke in English in the fifth panel! She temporarily knocked him out of his groove, and he forgot to shout at her in French. This further proves Selkie’s superior ball skills. That, or she has super powers. Selkie has such good aim. She could easily do Olympics stuff in her adult years, provided she gets enough hydration due to the gills.